There is a tradition at The Eliot Church in South Natick that when there are five Sundays in a month, the fifth Sunday is earmarked as "Service Sunday." This month, April, has five Sundays in it, but the members decided to make it a Service Saturdayinstead. And this time, it is the planet that will be served. Reverend Matthew Carriker, an Associate Pastor at the church, is also a Program Director at Cooperative Metropolitan Ministries (CMM), the oldest interfaith social justice network in the greater Boston area. In addition to their mission to address issues of violence, homelessness, and poverty, the organization has made a regional response to environmental justice one of its priorities. 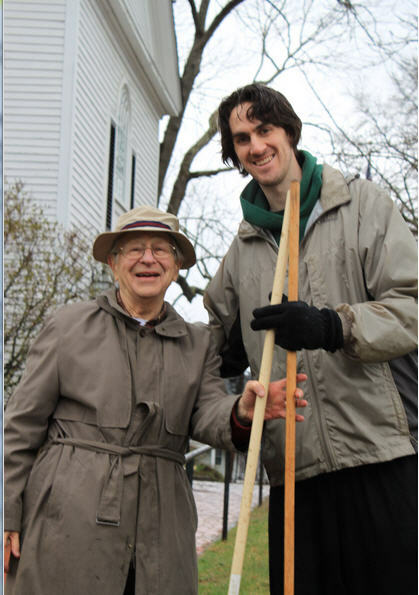 So, it was only natural that Carriker would help organize a community-wide environmental service project for Eliot's Service Saturday, open to Natick congregations, CMM partners, and the wider community. From 9am-12noon on April 21st -- the start of Earth Week 2012 -- approximately 50 members and non-members, aged 9 to 90, will be armed with trash bags to help clean up Pegan Cove Park near Natick Center. "Our Service Saturday will be in conjunction with clean ups happening everywhere," said Carriker. "It is inspiring to know that there are going to be many environmental service projects occurring across the state at the same time -- with many volunteers, from a spectrum of faiths, who are uniting at the same time to clean up our environment, and make our planet a better place to live for future generations." Pegan Cove was Eliot Church's focus because Carriker lives close to the park and it holds a special place in his heart. Carriker also is familiar with environmental groups in the area who could give advice on some of the areas in the park that are in need of the most work. "For me it's a great place to soak in the beauty of nature and rejuvenate and recharge. It saddens me to see parks that have been disregarded or become dumping grounds over the years," he said. "As a Christian and minister, I feel that the caring of creation is essential to living out our faith. This project is at the core to what it means to be good stewards of the earth." Pegan Cove Park is one of Natick's conservation areas and includes 22 acres of extensive shoreline on the South Pond of Lake Cochituate, woods and fields, Pegan Brook and its associated wetlands. It is just the type of area that inspires churches to affirm responsibility to care for God's creation and prompted the Massachusetts Conference Environmental Ministries Team to "regard the degradation of earth's environment and climate as one of the greatest moral challenges of our generation and a profound justice issue." "It may be one small park and one small step, but that's OK," he said. "We can't change the entire world overnight, but we can take one step on this journey of a thousand miles. The environmental crisis is a huge thing, but as Mother Theresa taught, our task is not to do great things, but to do small things with great love. Those small things make a difference. This clean-up day sends a message that we care about our park, our trails, and our environment." "We do works like this not just because they are good things to do (which they are) but because they also give us the opportunity to act out our faith," said Reverend Dr. Adam Tierney-Eliot, Eliot Church's Senior Pastor. "Projects like Pegan Cove reflect our commitment both to community service and to the natural world. Here at Eliot we try to work with the community on a variety of cleanup and planting projects. Right now we are also planning our new 'church garden' that will be located right next to our sanctuary. These activities remind us that we are a part of nature and must do our best to live in harmony with it. They help us be able to connect to that divine creation which gives us both life and joy." The Massachusetts Conference urges people to take action during Earth Week 2012 and beyond. Learn more here: http://www.macucc.org/pages/detail/2100. You can contact Adam and Matt at the church office at 508-653-2244 orinfo@theeliotchurch.org.